I hate looking at my bank account. Just seeing the app on my iPhone screen is sometimes enough to send me into a full-blown panic attack. Since moving out on my own three years ago in college, I’ve barely made enough to eat and pay rent. Sometimes, I would have to choose my meals wisely (PB&J sandwiches all week) to keep from hitting that zero balance on my bank account. I was working multiple part-time jobs while going to school full-time, and I still could barely make enough to survive. Freelance writing in college is what saved me! I’ve been pretty open with money on my blog. I like to share my freelance and blogging journey (AKA struggle) with you guys so you can learn from my mistakes and my success. Today was the first day I was able to actually open my bank account and breath a sigh of relief. It’s the holiday season, notoriously the most expensive time of year, but I have enough in my account AFTER paying rent to actually afford nice gifts for my friends and family and no longer count the days anxiously till my next bill is due. That’s 100% due to freelance writing. If you’ve been reading my blog for a while, you’ll know I’ve been slowly building my freelance writing momentum since graduating college in May. It hasn’t been easy, and it didn’t happen overnight. But here I am, on the other side. I finally feel like I’ve gotten my financial footing, and it’s liberating. That’s why I’m creating this post to share how to achieve this same freelance writing success for yourself while still in college! Keep reading for my complete guide! Why should I be a freelance writer in college? I’ve always known I wanted to be a writer, but I didn’t discover the world of freelancing until I was already in college. Companies, blogs, and publications are always looking for quality writing, and sometimes business owners don’t have any time of their own to dedicate to writing great pieces. Freelancers are able to fill in these gap by offering their skills for a fee. Freelance writing in college is perfect because you don’t have to worry about scheduling. When you have classes, it’s hard to coordinate a job around your already packed schedule. Freelancing is done remotely and you work with a series of deadlines which means you can set your own hours as needed. Freelance writing in college is also a great way to build your resume. Being able to write well is a valuable skill, so you’ll be a better job candidate by the time you graduate. You’ll also build a powerful writing portfolio which is useful when applying for jobs that ask for writing samples! The best part of freelance writing in college is it’s super easy to get started. You don’t need to be studying English or anything like that to be a successful freelance writer. Actually, your major-specific classes can come in handy when choosing a niche (we’ll talk more about that later). If you’re in college, odds are you’re already a decent writer. It’s not required, but it will definitely help if you set up your own website. I think it’s best to opt for a custom domain and self-hosting since you’ll look really professional. Not sure how to start? I have a step-by-step guide for starting your own self-hosted blog for less than the cost of a cup of coffee. You can use your website as a blog or as a virtual resume! Choose your niche, or at least brainstorm one. There’s a lot of disagreement in the freelancer community about the importance of niching down. I think when you’re first getting started, you should experiment with a couple of different areas that appeal to you so you can find what works best. Some niches are naturally more lucrative and in-demand than others. B2B (business to business/marketing) and tech are usually the top, most well-paid niches, but there are definitely a lot of choose from. Lifestyle is popular as well but it can be hard to make a lot of money with if you aren’t a big-name fashion blogger or lifestyle blogger. B2B – Business to business is a popular, often high-paying niche and is perfect for students with experience in social media management, communications, business, or marketing. Tech/IT – Are you a computer science or engineering major? You’re in major luck. If you can write quality articles about the tech industry, you’re basically guaranteed to be paid well. Millennial Perspective – This isn’t really a niche, but a lot of companies and industries are looking for Millennial perspectives to include on their blog or website! Travel – Are you a globetrotter? Did you study abroad? While it can be harder to find well-paying travel writing gigs, it’s not impossible! Fashion/Beauty – There are a lot of well-known beauty and fashion brands that love to include new, fashion-forward writers! You’ll need to get some experience. When you’re first getting started, you need some samples under your belt. As a college student who probably has a lot of writing assignments already, you might already have a few samples that will work for your writing business! Your writing samples should showcase your ability to write in your chosen niche. If you’ve decided to write about tech, for instance, you probably should include a blog post about the 5 Best Coffee Shops in Paris. A great way to research the perfect sample is just to check out some websites and popular blogs in that industry. Do your best to stay on top of the latest trends and changes in these areas so you’re ready for everything! Learn a bit about content marketing and SEO. If you want to be a majorly marketable freelance writer in college, you need to brush up on content marketing and SEO. Content marketing is essentially using content (usually written content like blog posts or pages) to attract new potential clients or customers. SEO is Search Engine Optimization, and this is basically the algorithm Google uses to rank websites in search results. You don’t need to switch majors or invest in any expensive training to learn content marketing and SEO. They’re both pretty simple, but a little knowledge will go a long way to improving your skills. Remember that writing for the web isn’t the same as writing a paper for class, so you might need to do a bit of practice before you get the hang of it. 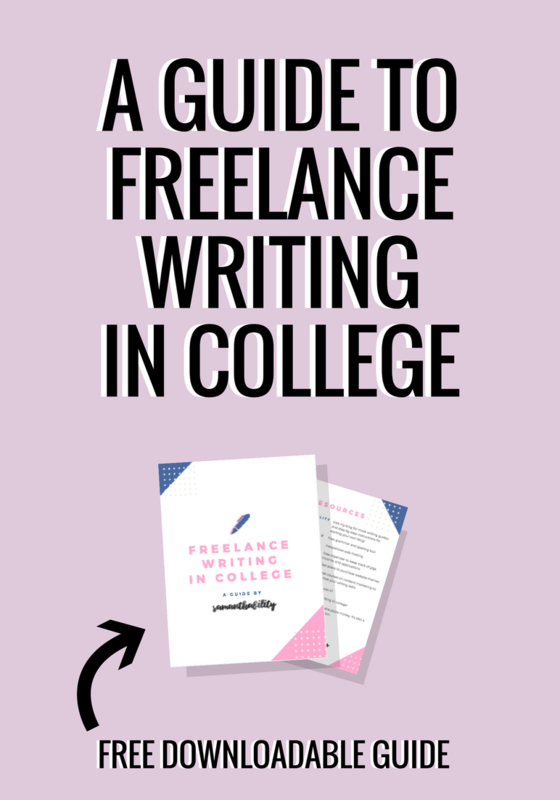 Are you ready to begin freelance writing in college? What are you waiting for? It’s time to take back your time as a college student and start earning money as a freelance writer! 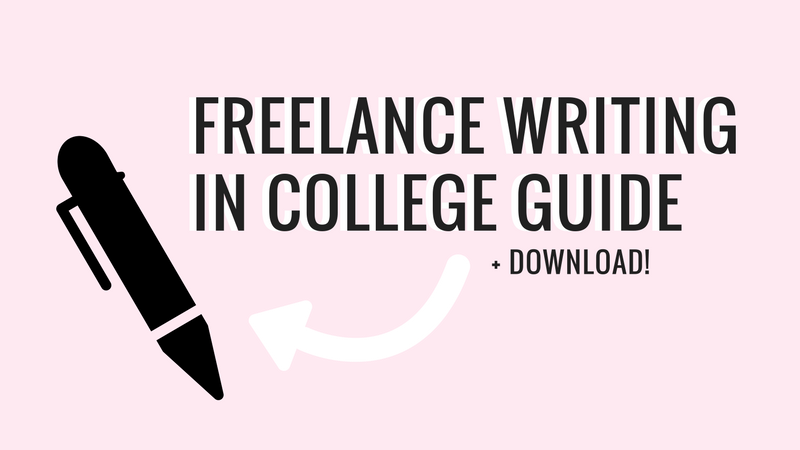 Fill out the form below to quickly download my guide on how to get started freelance writing in college. The 9-page guide includes everything you need like information on how to set up your writer website, where to apply for jobs, and how to pitch yourself as a writer when you have no experience! Download it now to get started! I hope you enjoyed this post on freelance writing in college! I’d love to hear about your college freelance writing journey! Let me know in the comments or send me an email! Best of luck!